Esophageal cancer is the eighth most common form of cancer in the Western world and the incidence is growing. The overall prognosis is bad, with 5-year survival rates of around 15%, a number that has not improved significantly over the years. There are several mechanisms that cause the more malignant phenotype. First of all, in case of hypoxia, the hypoxia-related pathway is activated, leading to upregulation of several pro-oncogenic genes and factors. Second, chemotherapy and radiotherapy are less effective when oxygen tension is low. Third, some tumor cells express transmembranous pumps that can effectively remove chemotherapy from the cell before it can exert its effect. 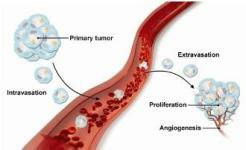 Fourth, hypoxia gives rise to angiogenesis, which could facilitate metastatic spread of tumor cells. Tumors with hypoxia have a more aggressive behavior, metastasize more often and have an overall worse prognosis. There are no effective therapeutic interventions for hypoxia yet, but important hypoxia-related factors have been identified, of which HIF-1a plays a key role. Nevertheless, there are two techniques that are promising in anti-cancer research. The first is the use of the targeted TRAIL-protein (tumor necrosis factor-related apoptosis-inducing ligand) which can effectively bind to tumor cells to induce apoptosis, while it leaves normal cells unharmed. The second is the use of in vivo functional imaging modalities like bio-optical imaging (i.e. bioluminescent imaging (BLI) and fluorescent imaging) in animal studies to non-invasively visualize tumors and tumor behavior. To mimic the situation of human cancer, animal models have been developed. There is, however, no consensus on one standard hypoxia model and there is little research on specific models for esophageal cancer. Current animal models for esophageal cancer in general and hypoxia in specific will be discussed, as well as the mechanism behind hypoxia and important hypoxia-related factors, including the use of TRAIL, concluding with a section on functional bio-optical imaging and its possibilities and limitations in anti-cancer research.